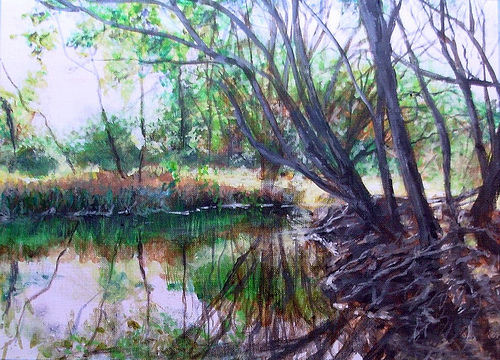 Subtle autumn colors reflecting in this rivers gentle current is what inspired me to paint this scene. 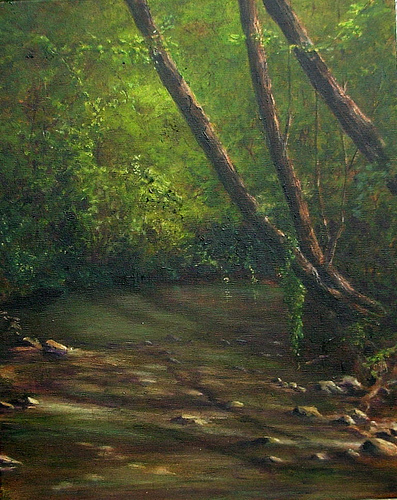 Much of the texture was created using a palette knife. This windswept snow scene was created mostly from my imagination. I started with the group of trees to the right, then decided on a row in the back, then turned them into pines, then added the patch of leaf-bare bushes and sticks to the left. 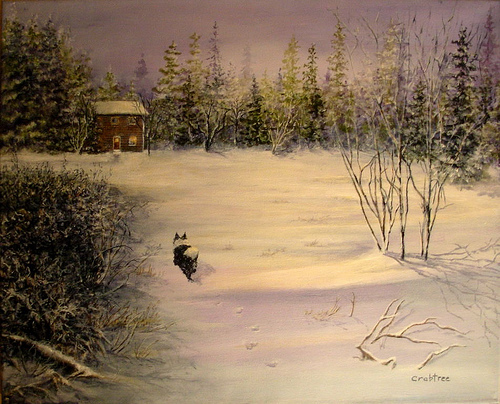 It seemed to need something more so I added the dog and then, he seemed to be heading nowhere, so I added a house. As with all my paintings, it's difficult sometimes to know when to stop. Although I could have added more, I decided to save the ideas for future paintings and call this one complete! Deep within the forest, there was a clearing… a place untouched and unspoiled. It was upon this spot these beautiful wild flowers happily grew… carefree, unaffected by the lack of attention or admiration. Flowers such as these are not destined to be picked, but to be painted. 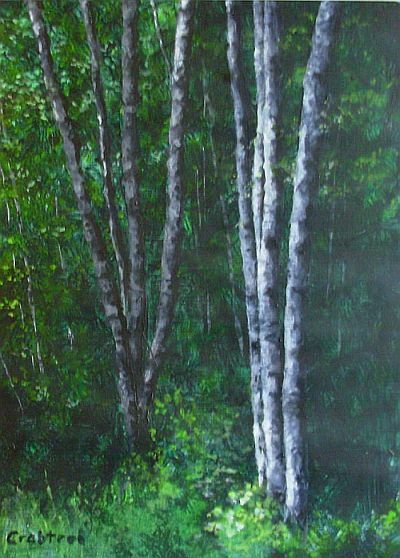 I very much enjoyed painting this beautiful scene as trees are my absolute favorite subjects! The reference was generously provided by Flickr.com member Steffe and can be viewed here. This, is heaven on earth. 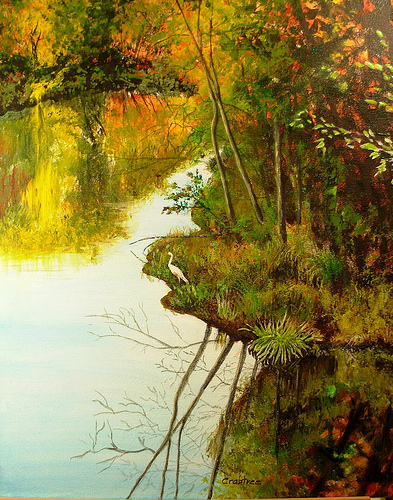 I enjoy most painting those places where man has never before stepped…where the sounds of the rivers’ rush and birds’ songs soothe the senses and mend the soul. 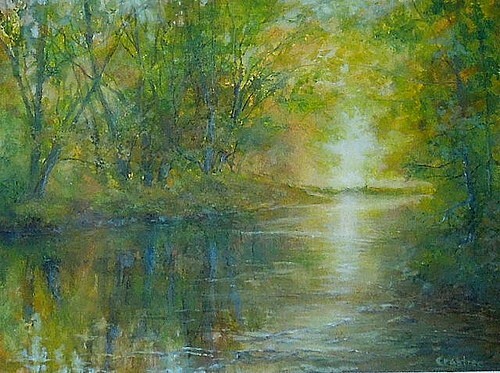 It is my hope and intention that these feelings of peace and serenity have been successfully transferred to canvas. Although she doesn’t paint, my sister, Theresa, has other unique artistic gifts. One of them is creating some absolutely stunning flower gardens and groupings and another is photography. 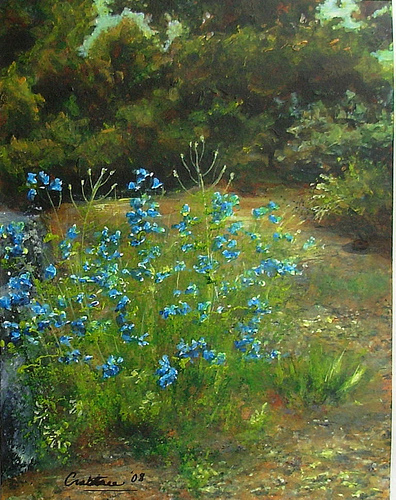 Both of these talents were shared here as “Theresa’s Garden” is based on one of her photos and portrays several of her garden areas. 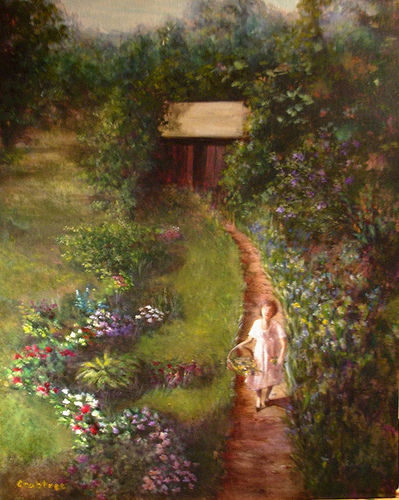 The little girl in the painting is a fictional character depicting the nostalgia and contentment of the carefree summers of days gone by; the basket of picked flowers symbolized the hope that we might choose and carry the most beautiful and memorable with us throughout our lives. I love those evening moments, when the sun is just about to tuck its head under the cover of night, and the last light playfully dances among the leaves on the trees. It is never more breathtaking or memorable than when one experiences the phenomenon in early autumn, laying beneath tall trees, looking up at the splendor. From somewhere, carried by the wind, the seeds fell to the ground, one, then the other. Through the seasons, the storms and the droughts, the seedlings survived, and as time went by, they grew at each others' sides, roots and branches mingling, sharing sun and rain, dancing in the wind, reaching for the sky, growing old together. One fall day, I took a road trip up to Williamston, Michigan to take some photos of the autumn display. 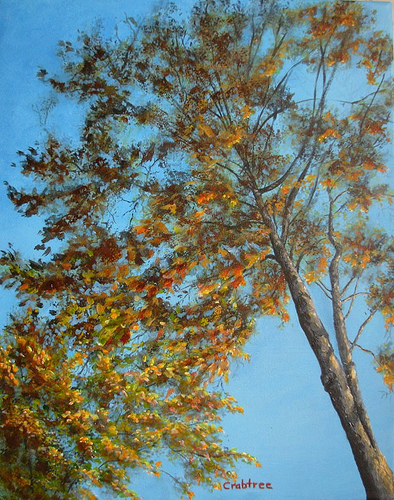 “Autumn Reflections” was based on my favorite of the bunch. The bird on the riverbank was enjoying, as was I, the peaceful surroundings in this beautiful place, where nothing but nature could be heard. The wind was as still as the water’s reflections, setting the stage for the bold and vibrant starlets of Autumn to be showcased. The very best way to unwind for me is to paint. Therapy begins with a fresh, white canvas beckoning from the easel…and as I go about my tasks, choosing colors and brushes, and cleaning old paint from the palette… without even realizing when, troublesome thoughts and unresolved issues simply fade away and creative passion takes its place. This painting sprang forth from my imagination on such a Friday night. In the wee hours of the next morning, my soul was finally creatively spent; by then, I had long forgotten all else but what had emerged on my canvas. There is nothing more beautiful or refreshing to the spirit than to spend time with nature...the sounds ... the smells...they are as much a part of the experience as what is seen. 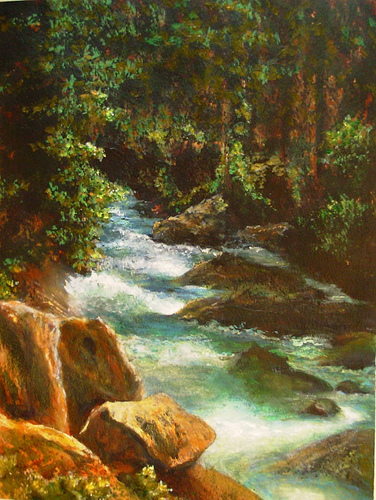 When I put brush to paint, I hope to convey all three and to take the viewer to some special place in their memory or past. This painting, and three others from this series, were created from my imagination during a time in my life when I was very ill, but didn’t know it. 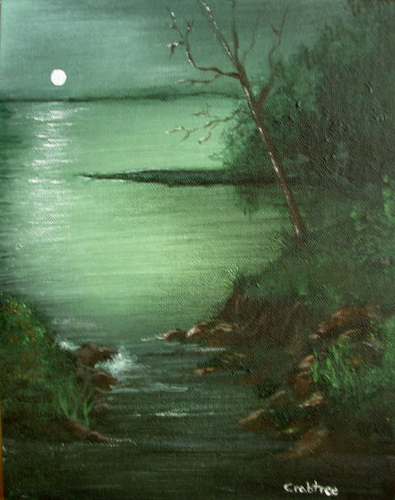 As I look at this painting now, and remember then, I see what was being depicted…the sporadic pains; the waves against the banks…the dark colors; the feeling of hopelessness...the single tree; aloneness, despair. Still, the tree reaches for the light. The light is hope. The other three paintings were given as gifts to family and friends who cared for me during my illness and recovery. This one remains in my personal collection. 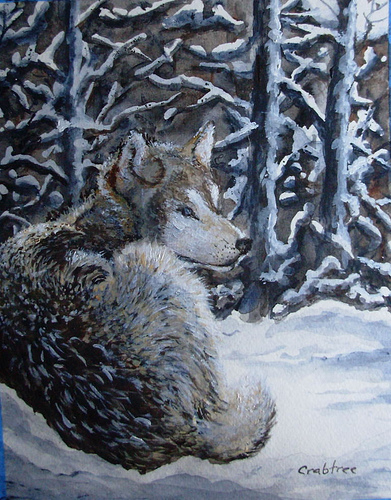 This wintry scene was painted as a gift for a friend who collects everything"wolf." My intention was to paint a different kind of wolf scene rather than the typical strong, hearty animal baying at the moon; this guy seemed rather vulnerable, and perhaps a bit lovable. He made an excellent subject! 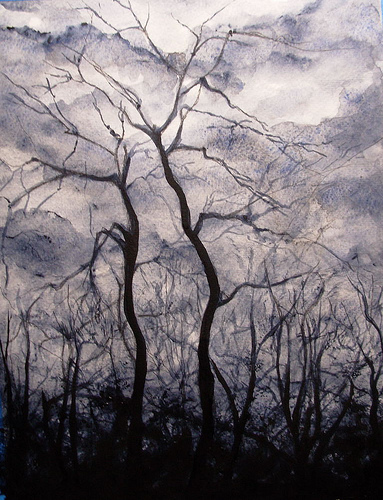 The trees in the background were an experiment with Frisket, a technique usually used with watercolors where the artist coats an area with the Frisket, paints the area, then removes the material leaving blank paper(or another color) underneath. The painting was well received by my friend. 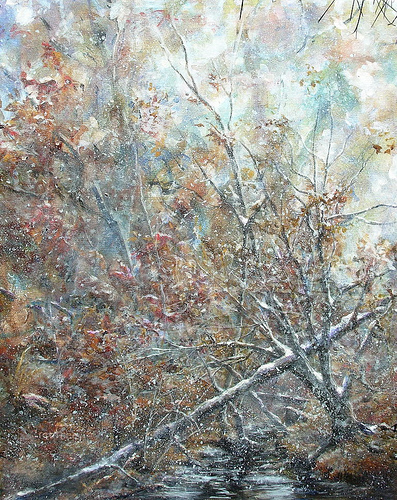 Before putting brush to canvas, I knew only that I wanted to depict that moment in late fall or early winter when the snow comes down in big, wet blobs and then quickly melts away. Paintings like this take on a life of their own. 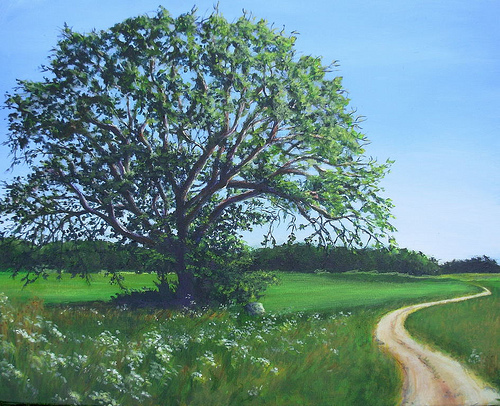 As I’m painting, I might see a tree or a rock or a bit of sky…and I simply let the painting speak, and paint toward that voice. 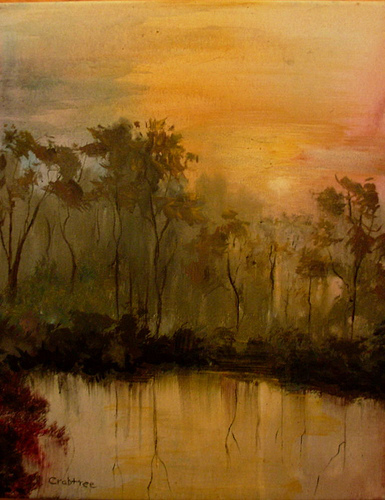 Painting from one’s imagination is a beautiful way to relieve the stresses of the day. 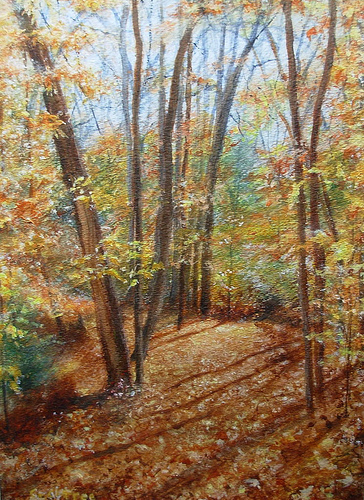 It came to mind one Saturday in early fall last year, that if I didn't grab my paints and get outside, I may not get another chance. That afternoon, this painting came to life. 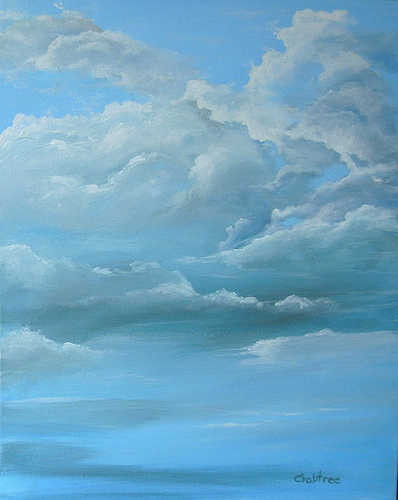 Although I finished it in my studio, I believe I still captured the mood and colors and play of the beautiful clouds I saw that day.